Securing reliable supplies of clean water for today and the future is a critical concern for communities across the country, and particularly in the Southeast, where communities are grappling with water scarcity issues more than ever before. 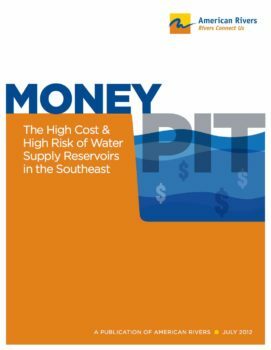 This report documents the financial risks and water resource risks tied to the development of new water supply reservoirs in the Southeast. It comes as many local governments throughout Georgia, the Carolinas and neighboring states are considering significant spending of public taxpayer and ratepayer dollars to build new water supply reservoirs. Georgia reservoir proposals on the drawing board, for example, could total $10 billion in taxpayer and ratepayer dollars. The report also shines a light on recent water supply reservoir projects that provide cautionary tales of communities burdened by expense and debt. Reservoirs are highly expensive, racking up debt for ratepayers and taxpayers. A reservoir’s price tag is typically a moving target. Reservoir financing plans often rely on inflated population growth projections, ultimately leaving existing residents holding the bag. In order to remain full, a reservoir depends on increasingly uncertain rainfall. And, a reservoir loses water when high temperatures cause evaporation. Reservoir water is a contested resource subject to competing demands in the river system. Optimize existing water infrastructure first. Plan for water use to decrease as a community grows. Pursue flexible water supply solutions, like efficiency measures. Demand accurate assessments of costs. Examine water availability to minimize resource risks. As communities endeavor to find ways to secure water supplies, it is critical that decision-making add to a community’s flexibility and resilience. The high-price, high-risk water supply reservoir strategy can leave a community financially vulnerable, tying up assets and leaving taxpayers and ratepayers on the hook without a guarantee that the water will be there when they need it. There is a more prudent and proven path to providing water supply and ensuring flexibility for the future, one rooted in stewardship of public dollars and natural resources both. As Southeastern communities move forward to develop strategies to meet tomorrow’s needs, the communities that choose a prudent path will be better positioned—from both a financial and water resource perspective—to address the needs of today and the future.